1. Find the value of tan15°tan20°tan7°tan75°? 2. Find the value of tan (55°−θ) − cot (35°+ θ)? 3. If cos 9α = sin α, then find the value of α? 4. If tan θ =√3, find the value of sec θ? 6. If Cos A+Cos2 A=1, then find the value of Sin A+Sin2 A=1? 7. If sin A + 2 cos A = 1, then find the value of 2 sin A – cos A? 8. If sin A + Sin2 A = 1 then find the value of Cos2 A+Cos2 A? 9. If x cos A = 1 and tan A = y, then find the value of x²− y²? 10. If sinθ + cosθ = √2cosθ then find the value of cos θ – sin θ? Find the value of tan 15° tan 20° tan 7° tan 75° ? 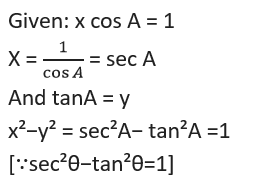 Find the value of tan (55°−θ) − cot (35°+ θ)? If cos 9α = sin α, then find the value of α? If tan θ =√3, find the value of sec θ? If CosA +Cos2 A=1, then find the value of Sin A +Sin2 A = 1? If sin A + 2 cos A = 1, then find the value of 2 sin A – cos A? If sin A + Sin2 A = 1 then find the value of Cos2 A+Cos4 A? If x cos A = 1 and tan A = y, then find the value of x²− y²? 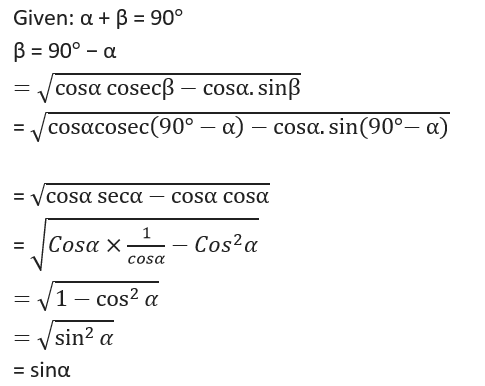 If sinθ + cosθ = √2 cosθ then find the value of cos θ – sin θ?